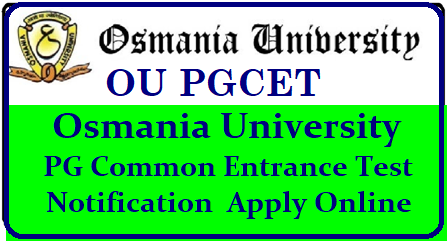 OUCET 2018 : Osmania University Common Entrance Tests (OUCET) are being conducted by Osmania University for admission into various PG/PG Diploma and 5 Years integrated programmes offered by Osmania ,Telangana, Mahatma ghandhi , Palamuru Universities & its affiliated colleges in Telangana state.Ousmania University the main conducting authority and will announce the OUCET 2018 Notification in the April 2018 for the academic 2017-2018 year.So eligible candidates those who are interested may apply online only.To know more details regarding OUCET 2018 Registration,Application fee,Eligibility,Exam date,How to Apply and other information given below. Candidate should pay for a single subject Rs.400 /- for OC/BC candidates and Rs.350/- for SC/ST/PH candidates. For each additional subject , the fee is Rs.250/- for all categories. Payment can be made through the TS /AP Online/ Credit / Debit Card / Net banking. Candidate should have passed B.Sc/B.A (or) its equivalent examination with not less than 40% marks. For SC/ST candidates , a pass marks in the equivalent examination is sufficient. Candidates passing the bachelor's degree examination compartmentally are also eligible . 1.The OUCET 2018 Exam in all subjects will be conducted in offline exam. 2. Exam will be conducted in 100 Objective type (MCQ) questions in 90 Minutes duration. 3.For M.P.Ed, the exam will be conducted for 75 questions with 75 Marks. 4.There no negative marks for wrong answers. 1.Goto official website i.e www.ouadmissions.com. / www.osmania.ac.in. 2.Registered with candidate primary information such as name,date of birth & etc and pay the registration fee. 3.Once registration is completed, the candidate will receive a registration ID. 5.Then login with registered ID and fill Online Application with candidate correct details such as education details,Name, date of birth,exam center,category,Address etc. 6.Upload scanned color Photo & Signature in JPEG format. 7.Candidate must Take printout of the " OUCET Online Application 2018 " for future reference. The OUCET Hall ticket will be available in the 1st week of April 2018 .So candidates have to download the hall ticket through online only.The examination authority will not send the the hall ticket by post.The examination will not be sent by post. The admission will be based on candidate performance in OUCET 2018 entrance examination.The qualified candidate will be assigned ranking in the order of merit on the basis of score obtained in the examination in OUCET 2018.After announcement of results,then will be called for counselling. OUCET Result will be announced in the 3rd week of May 2018 through online.Candidate may get the result by enter the hall ticket number on official website.The result shows the candidate Name,marks,rank,roll number,exam center and other information.Candidate must take the print of the result for future reference. The OUCET Counselling will be began in 1st week of June 2018.The counselling and seat allotment is completely online process.So candidate must register for online after counselling information updated on official website.After that candidate will be called for certificate verification and exercising the web options.After seat allotment, candidate can download the seat allotment order and report the college. Before going to apply candidate must know the instructions carefully by visiting the official website .Eligible candidate should be apply online only ,there is no other mode to apply.